With a slim silhouette and minimal details the Gathering Mini Pendant wows in all the right places. 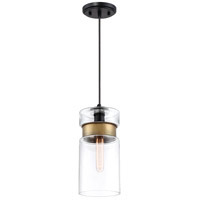 The clear glass is cylindrical and to add a pop of color it is cinched with a broad band of painted brass. This cable-hung fixture can be adjusted to suit your needs and the matte mystic black finish coordinates with it perfectly.